I would recommend Gilmore Studios over and over again. They are professional and what I really love is the guidance they give when taking photos. They make you feel comfortable and also make it really fun. We used Gilmore Studios as our wedding photographers and they went above and beyond. They are trusting and reliable. They are also GREAT with kids. I was so impressed with how they got all the kids in the photos to smile together! They captured our whole day and the photos turned out absolutely stunning! The photos were ready to view very timely (within a month, with teasers ready even earlier) and accessible online. Jen & Brian are absolutely amazing!! They both are so wonderful and amazing to work with. They captured every little detail that were and still are so significant of the first day of our lives together as MR. and MRS. Smith. We were able to re-live every moment of our wedding day by looking at all of photos taken by Jen and Brian. We also had an amazing engagement session with them. They made it so easy and natural to take the pictures. They truely are an amazing couple and we will be referring any one that needs any type of professional photos taken to Gilmore Studios !! Not only do their pictures speak for themselves, once you meet them you will not want to have anyone else share the special times with you. Most amazing photographers. They took pictures of details that would have otherwise been missed. The cake company dropped our wedding cake and Brian called his contact and secured a small two level cake so we would have a cake to cut. Great ideas, stunning photos, nicest people to work with, totally professional. Can't say enough positive, glowing things about Gilmore Studios. I would not hesitate to use again and will refer to everyone I know. I cannot say enough about Gilmore Studios and their quality of service. When we started the process of finding a photographer we chose them because it was a personal reference. The only part I looked at for photographers was their actual photography. Not only does Gilmore Studios establish wonderful photography but through the whole time they were professional, helpful, and prepared myself for the day of the wedding. Jennifer went above and beyond to communicate sending emails with updates on what I should know up until the wedding. I felt so prepared the day of the wedding that I didn't need to worry. When the wedding day came Jennifer and Brian were so calm and knew exactly what to do fixing any problems seamlessly. They are able to work with large crowds of people as well as manage any type of age group. We had a 3 1/2 year old flower girl and they were so good with getting the best pictures of her! All of the vendors and guests we spoke with mentioned that they were very professional the day of the wedding and easy to work with. If you are stuck on trying to find a photographer Gilmore Studios has the whole package!!! I highly recommend using them for your next event!! I don't think I can say enough good things about Gilmore Studios! They were beyond professional and fun, they are so good with children and putting everyone at ease. They make you feel like you are the only wedding they are working and like it is their first time too (in a good way, not like "eh we do this all the time"). It was such a great experience to work with them, they are so energetic and it is infectious! They are so flexible and are open to whatever you want to do. HIGHLY RECOMMEND!! Not being from Orange County originally, Jennifer was so helpful when I asked for some recommendations for other vendors, her recommendations were amazing and helped to make our day absolutely perfect! We used their photobooth at our wedding, it was easy to use and took great photos. They had several backgrounds and props to choose from and I couldn't have been happier with the experience! We have received SO MANY compliments on our amazing engagement photos (a few people actually asking for Gilmore Studios contact information for their wedding photos based off of our engagement photos) and now on our wedding photos. They are absolutely perfect, everything we asked for, our pictures were full of heart, love, laughter and they really captured the candid moments. Gilmore Studios did a great job with photography for our wedding. I would hire them again, and would recommend them without reservation to other couples. Jennifer and Brian photographed our wedding. There is no words to describe how amazing of a job they did and how thankful we are for their hard work. They work great as a team and exceeded our expectations of capturing the most important moments and all the little details. All of our pictures came out beautiful. Jennifer and Brian are so professional and were a major reason as to why our wedding day went so smoothly. They did a great job directing everyone and making us feel comfortable during the whole experience. I without a doubt recommend anyone who is looking for a photographer to stop looking and hire Jennifer and Brian because I am certain you will not be disappointed! 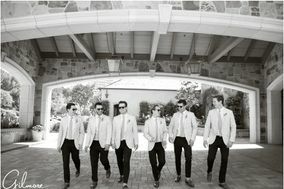 Your wedding at the Hyatt in Newport Beach was one of the best we've seen there! You kept us busy with all the details (we LOVE details) It was our pleasure photographing your wedding and we can't wait to document your next big milestone :) Thanks for the kind words! We first met Jen & Brian at my sister's wedding in LA. The bride had the flu the day of her wedding, yet when we look back on the photos, you can't even tell she was sick! Major props to Jen + Brian. We loved them so much, we asked them to shoot our wedding the following year. Jen + Brian are so fabulous. Incredibly quick, professional, and efficient. They had the digitals mailed to us on a usb that arrived on our "one month" anniversary and at our 1 year anniversary this year they sent us a beautiful framed wedding photo. Such a fun surprise! Editing was top notch and we loved the variety of shots and poses. We will def utilize them in the future for baby photos and refer them to all our California friends!! They are absolutely worth every penny and to this day, we love to look back on our wedding photos. Jennifer and Brian were absolutely wonderful! From the engagement photos to the wedding, everything was done with ease--they made it more fun than I had imagined!! I can't thank them enough for the work they've done...being able to revisit these over and over is a gift that will last forever. Thank you Gilmore Studios and I hope to work with you again sometime! It was a blast!!! Thanks Chelsea! We had so much fun with you guys- let's get together for dinner one of these days! Tina and Aj's photos of their wedding were amazing. It was like being there in person all over again. 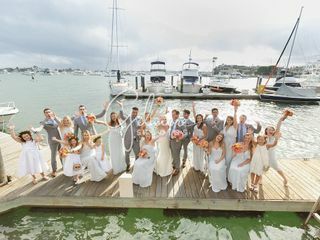 We loved how fast and specific Jennifer's instructions were in positioning us for group photos and yet how they were able to still capture the candid shots as well. The pictures inside the venue had just the right amount of lighting so that the effect of the venue was still maintained with all the twinkle lighting. The pictures on the beach at sunset were beautiful .We would highly recommend Gilmore studios for any of your photography needs. Here are some of our photos, hope you enjoy as much as we did! Gilmore Studios photographed my daughters wedding in NYC. Jennifer and Brian were so wonderful and accommodating in every situation, even on the streets of NY hailing a cab. We couldn’t have asked for a better photography/couple to commemorate this beautiful day for our children. The photographs are all wonderful it is very hard to choose, from the Botanical Gardens to the Promenade in Central Park. We couldn’t have asked for anything more, they captured the love, joy and fun of the entire wedding. Jennifer and Brian were amazing! We could not have been happier with their level of perfection. They captured every moment and emotion through the day and weekend. They even had snippets of video taken that we didn't know they were taking, which was such an amazing surprise since we didn't have a videographer. Their professionalism made us feel comfortable from the beginning. We loved how they got pictures quickly and moved on so we weren't burnt out from all of the photos. You also couldn't tell they were there most of the night, not getting in the way, etc which was really important to us. What a great couple to work with!!! The quality of their work is amazing! We saw some examples of Jennifer’s previous work, and we knew we had to have her as our photographer. She was great through the whole experience! She was extremely friendly and professional. She took the time to get to know us and listened to what we wanted for our event. My Husband and I aren’t really picture people. Jennifer was very patient with us and made an effort to make us feel comfortable in front of the camera. We loved our wedding pictures! She definitely has a talent for capturing candid, special moments on camera. Jennifer went above and beyond and even videotaped some parts of our wedding, since we didn’t have a videographer. I have already recommended Jennifer to some of my friends. Gilmore studios went above and beyond when it came to photographing our wedding. Our photographs turned out better then I could have imagined and there were so many to pick from. They also provided tons of other services so I didn't have to go through other vendors, such as engagement pictures, guestbook, and thank you cards. They were so friendly and willing to do anything I asked. They were so organized in taking pictures in order that people weren't standing around the entire time, and making sure me and my husband were wilting in the hot sun all day. I would recommend them to anyone and use them again for other opportunities. We selected Gilmore Studios because we felt in reviewing samples of their work that they were able to capture things a little differently than others. After seeing the result from our wedding pictures we are definately glad we selected them as our photographers for our wedding. They were able to work with a couple of areas we liked for backgrounds and came up with some incredibly beautiful and artistic shots. They were easy to work with, took our ideas into consideration and worked them into the shots and were very patient with our amatuer photographer guests. They helped make our special day that much more fun and our pictures really do a great job in capturing all of the events. Thanks so much Jennifer & Brian, we love how they all came out. I can't say enough great things about Jennifer and Brian. They are a fun, young couple that really know what they are doing. I am not photogenic at all and the thought of posing for pictures is very unnerving. Jennifer and Brian very quickly make you feel at ease. There style is very natural, lots of candids and just enough posed photos. You will not be disappointed! I have nothing but great things to say about Jennifer and Brian. This husband and wife duo got awesome shots, were so nice and totally worth every penny! Very down to earth, nice people, and super easy to work with. Photography is not cheap, but it is worth every penny, and the stress free, can-do attitude of this dynamic duo makes your big day so much easier. Getting the photos taken is fun, quick and simple, and they look fantastic. It's like if your friends were just there to snap some cool shots, its completely unobtrusive. The resulting photos look superb and are top quality work in terms of composition, lighting, framing, and every little detail that just makes a professional photo look amazing.